Thermal Imaging (IR) can be used on all hull materials to Identify structural members of hulls constructed of fiberglass, wood, steel, and aluminum.Locate trapped moisture in hulls and decks constructed of fiberglass, wood, steel, and aluminum. Locate moisture trapped around glassed in chainplates on sailboats. Find voids, previous repairs, delamination and debonding in fiberglass and composite hulls. 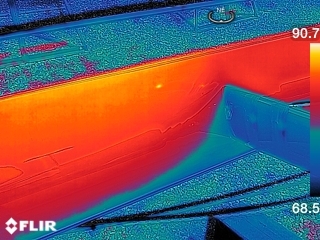 Tap testing, moisture meter readings, and UT are often used along with IR in our hull inspections. IR is helpful in locating loose connections, faulty fuses and breakers. 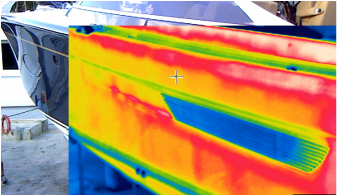 Thermal Imaging inspections of electrical systems are helpful in the loss prevention of fires aboard yachts. 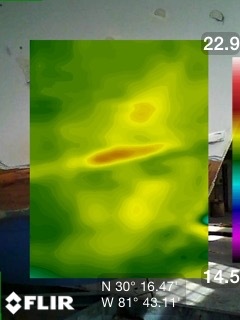 IR is helpfull to map out areas needing repair and to confirm if a proper repair has been performend. Useful in the inspection of electrical systems in locating problem areas and to ensure there is no overheating on newly installed systems. IR is helpful to find cracking and delamination after a mast has suffered damage. IR can find damage to the mast that the human eye cannot. All IR inspections are performed along with tap testing and UT testing to confirm anomalies.